Our Pastoral Care ministries are comprised of a number of different groups, all of which share the common goal of ministering in Christ to those in the congregation in need of meals, rides to church, prayer both long-term and immediate and the Holy Eucharist when home-bound. In all instances, a call to our church office can connect you to these ministries. If you would like your name or someone else you know to be included on the Prayer List, please call or email your prayer requests to the church office by Thursday morning. The prayer list is updated weekly and distributed at all Sunday services. When an urgent request for prayer comes in (i.e an accident or other emergency) a telephone prayer list is activated. Contact Joanne Peterson. Daughters of the King, with aid of members of Episcopal Church Women, carry the tradition of knitting shawls while engaged in prayer. These shawls are then blessed at healing services and distributed to those in need of comfort and prayer. 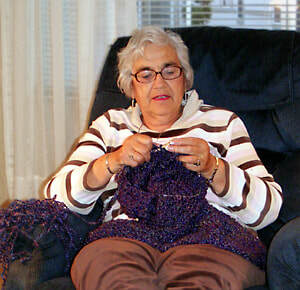 Prayer shawls offer a tangible way to feel the love of God’s embrace. To join the prayer shawl ministry contact Joanne Peterson. Many members of the congregation offer to prepare and deliver meals to parishioners in times of illness and pastoral need. Contact Mary Jane Chambers. If you need a ride to church or to a doctor’s appointment, or can offer a ride, contact Mary Jane Chambers. The caring ministries team visits some of our parishioners who are homebound and visits those who temporarily cannot make it to church. If you’re interested in joining this group or you know of someone who needs a visit, contact Joanne Peterson. A team of trained lay ministers bring Holy Communion to members of the congregation who are ill or otherwise unable to come to church. During Holy Eucharist, Lay Eucharistic Ministers are blessed by the Priest to bring holy bread and wine to our sisters and brothers in Christ. Contact Cindy Phillips. ​Currently not active as St. John’s. If interested or for more information contact Andrea Seitz.